Grilling is a healthy way to prepare foods and is popular during the summer months. Be aware of how to avoid the cancer causing compounds associated with grilling. The carcinogens, Heterocyclic Amines (HCA) and Polycyclic Aromatic Hydrocarbons (PAH), form when fat from meat is heated to high temperatures or when the fat drips into the flames. To minimize this risk, have lean cuts of meat, poultry or fish and trim away excess fat before grilling. To lessen how long the meat stays on the grill, pre-cook it in the microwave for up to one minute. 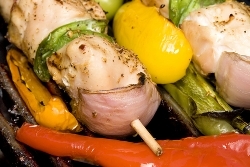 Marinade helps blunt the heat from grilling so fewer cancer-causing compounds form. Select healthy meats like lean or extra lean ground beef (90 – 95% lean), lean turkey burger (be sure it’s all white meat), veggie burger, or nitrate free turkey dogs. Remove the skin on poultry to reduce fat content by half.